Things could've worked out pretty differently for BioWare’s Anthem game. It's set to launch on February 22 as a full-priced, triple-A product – the sort that you’d expect from one of the biggest and most influential studios in the world. But Anthem is, in many ways, a departure from BioWare’s typical RPG framework; this live-service looter shooter is worlds apart from the likes of Mass Effect and Dragon Age. So perhaps it’s no wonder that the studio once considered a different release model altogether, back when Anthem first entered development six years ago. Subscribe via Print or Digital for as little as £12 / $9 for a quarterly digital subscription and get the must-have companion for game industry professionals, aspiring game-makers and super-committed hobbyists. Issue #329 is on-sale now, featuring exclusive coverage on Anthem and a whole lot more. "We discussed a free-to-play model early on," Jonathan Warner tells Edge magazine during its exclusive visit to the Edmonton-based studio. "It just wasn’t a direction that the company was moving in – BioWare or EA. Dave Brevik did it with Marvel Heroes, and I think it’s an interesting business model. It has its ups and downs." The model certainly has its pros and cons, but so too has EA’s approach to the monetization of full-priced, triple-A releases. Be it the constant criticism levied at FIFA’s Ultimate Team, the furore that erupted out of Battlefield 5 storefront or, of course, the universally derided approach the publisher took to the implementation of loot boxes in Star Wars Battlefront 2. It’s interesting then, given all of the controversies that have arisen out of EA’s business practices over the years, to see how consumer friendly Anthem is in this respect. Or, I should say, appears to be - the studio is still refusing to release firm details or numbers specific to the premium side to the game. What we do know is that Anthem will feature two currencies: earnable in-game Coins, and a premium currency, Shards, that can only be redeemed for cosmetic items. As promised numerous times by the studio, future story and end-game related updates, as well as any DLC, will be free for all players. Anthem’s lead producer Ben Irving went into further detail with Edge, as part of its all-encompassing cover feature on the upcoming action-RPG. "If you go free-to-play, you still have to have a profitable business or we can’t continue to do an amazing live service for all of our amazing players" Irving said. "So what would you really be trading if you gave the game away for free? There’s all that money you’d have to make to be profitable. And so then you get into the territory of being less player generous. I think in the triple-A space, people are more comfortable paying the entry fee and then having a great player-generous model with no paid DLC, and optional vanity items that you can earn in-game currency to buy anyway." "So what would you really be trading if you gave the game away for free?" It sounds promising, but there are still questions. We currently have no idea how much these cosmetic vanity items will cost - BioWare insists that it's still finalising pricing as it works towards release. As a result, we also have no idea how long it will take to grind out enough Coins to purchase said items without having to empty Shards out of your digital wallet. Still, it’s fascinating to think of what might have been. For more fascinating details on Anthem, you’ll want to get your hands on issue 329 of Edge magazine. 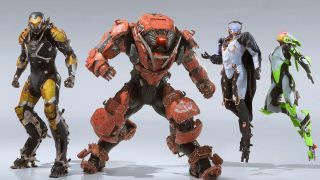 The team was given full access to the studio, going into great detail on the origins of Anthem, the evolution of the incredible flying mechanics that will surely come to define the game, and so much more. To get more from Edge magazine, you can subscribe via Print or Digital for as little as $9 for a quarterly digital subscription. For all of the latest Anthem news, features and interviews, be sure to click through to our On The Radar: Anthem hub for our exclusive coverage on the upcoming game from BioWare.